I haven’t posted a Smackdown in weeks because, well, I was silenced by self-loathing after two months of intensive, carbon-emitting air travel. The good news is, the travel spree seems to have tapered off, which means I can go easy on the self-flagellating and carbon-offset buying and focus on actions that do some concrete good. A couple weeks ago, traces of perchlorinate, or “perc”—a highly toxic dry-cleaning chemical— were found in the water supply in Queens, near my apartment. Thoroughly creeped out by this, I did a little research and found a “green” clothes-cleaning shop that I now use instead of my old dry cleaner and laundromat. It eschews perc in favor of natural products made by Ecover for both delicates and everyday laundry, and they even wash in cold water to save energy. Now, I know what you might be thinking: Soap is the least of our environmental worries, right? Well, not really. Anything you use to clean eventually ends up in the water supply, and most products contain phosphates that are toxic to aquatic life—particularly the plants and tiny phytoplankton that marine animals eat. 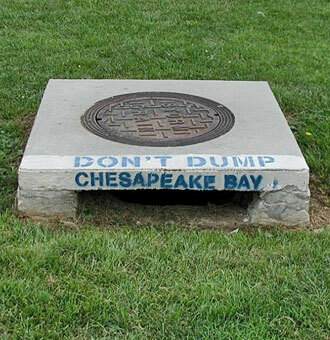 Growing up in the Chesapeake Bay watershed, I was made acutely aware of that fact through public-service announcements and in-school environmental programs. Even the storm drains were marked “Chesapeake Bay drainage,” to remind you that anything you poured down there was going to wash into the feeding grounds for your striped bass and oyster-on-the-half-shell dinner. In New York, people don’t really seem to have embraced the “Save the Bay” ethos. The Hudson is full of PCBs from decades of industrial dumping, Newtown Creek is the site of one of the country’s most toxic sewage-treatment centers, the East River is full of… well, Jimmy Hoffa’s body… you get my drift. These things take time for large communities of people to learn, but sometimes the best we can do is try to be models of good behavior. So I was pretty psyched about finding a better way to do my laundry, but I was also inspired to make sure I hadn’t slipped into any bad habits with the other household chemicals in my apartment. I don’t have a yard, so there are no fertilizers or pesticides to contend with (although if there were, I’d be using compost and Dr. Bronner’s biodegradable soap to, respectively, enhance the soil and chase away creepy crawlies). The main sources of chemical pollution in my apartment (apart from the paint VOCs that were unfortunately emitting before I got there) are the products that clean my surfaces, clothes and self. I just rub a little dirt on whatever's clean because you can, you know, exfoliate anything. If stuff is like real dirty, I use sand because sand is the cleanest subject on Earth save for moonbeams but I save those in a jar and wouldn't waste them on cleaning when they're so useful for exorcisms. As a mom of three growing children I found that when I would buy produce before we could consume it the produce would go bad. That doesn’t surprise me seeing as how everything goes bad before you can eat it nowadays. Even if I would juice the produce it did not taste as fresh as the day I brought it home. I researched the reason and found that there is device that works in your refrigerator that will help prolong the shelf life of organic produce plus it kills bacteria. It is the best thing I have ever owned and I think everyone should own one. I found it at www.orderminimate.com. It’s called the Mini Mate. I have had mine for over 60 days and it has already saved me $20.00 which is a fraction of what I paid for it. Has anyone else ever used this before? There are still soap that are made up of green and naturals ingredients, it is safe for the environment and to our health as well.